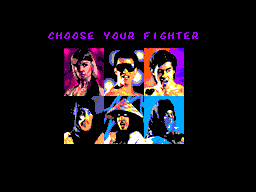 The game is a standard one-on-one fighting game, and surprisingly unlike any other previously released on the SMS, each character in the game has retained most of their individual special moves which had been in the versions released on technically superior hardware. This had been a big worry of mine at the time, would the game be watered down with all characters only having generic moves as had been the case with so many beat ‘em ups brought to the SMS? So I was pleasantly surprised from the onset. To perform each special move you have to learn the sequences to press buttons and D-pad, but you will soon pick them up with a decent sessions gameplay. The tournament format is good, with each round beyond the first 2 or 3 getting progressively harder. My only gripe with difficulty is that I have always considered Goro (the penultimate opponent) a LOT harder to beat than Shang Tsung (The last), who I beat in straight rounds the very first time I met him! The gameplay itself is all pretty good, the characters do move ever so slightly more jerky and less smooth than in the Megadrive and arcade version, but that was surely to be expected given the huge ambition of the project which was undertaken! All in all, the game is very very playable, and if you like fighting games, you'll love it. The graphics were definitely the revolutionary quality in this game at the time of its release. Nothing like it had ever been attempted for the SMS before, and all in all it worked very well. The characters actually do resemble real people unless your nose is pressed against the screen, and the blood flying is pretty good too! Movement isn't quite fluid, but it does the job well regardless, and actually does have an arcade feel about it. 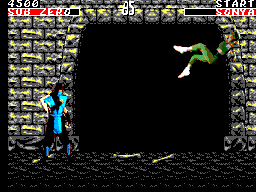 The backgrounds are not quite so good, as only two of the original game background scenes managed to make it with the conversion, so you don find yourself thinking "I've been here before haven't I?" quite a few times during a game. Conversely, if you take other games in the same genre for the SMS such as Pit-Fighter, you're in the same arena all the time, so it's still an increase in quality over that. (In fact I can't believe I even mentioned an awful game like Pit-Fighter in the same sentence as Mortal Kombat, it doesn't deserve it really!). In fact, as they are, the backgrounds still manage to do the job of keeping the dark atmosphere intact throughout the game. All in all, an incredible job has been made on the graphics and a cliche it may be, but sometimes, you could forget you're playing a Master System! The area that often lets the Master System down is the sound, and obviously I wasn't expecting much different from Mortal Kombat. In spite of the synthetic speech being lost in the conversion, I have to say that my expectations were actually surpassed in this regard. The tunes actually contribute well to the frantic atmosphere, and can be quite chilling the first time you hear them. Ok, they do get a little repetitive by the time you reach the 6th round, but then that would be the same even if you played it in the arcade, so you can't really justify calling it a fault. The sound effects when hitting an opponent are average, could have been better but then could have been worse - maybe a little tinny for my liking. All in all, the sound does the job, and whilst not striking makes a decent contribution to the game. The controls was another area that worried me about the conversion of Mortal Kombat before I actually played it. The arcade had a lot of buttons, as did the Megadrive (6 button controller had been released by this point), so how could the SMS manage it? Well once again a good job was done, simply wit hone button to punch, and another to kick, different combinations with the D-Pad resulting in different types of Punch and kick i.e. high, low, roundhouse, uppercut, sweep etc. And as mentioned earlier the individual and finishing moves can be mastered relatively easily. Given the huge range of moves on offer, and the extremely limited SMS controllers on offer, the programmers really did a top-notch job. A most impressive and successful conversion of a classic arcade hit. It's not identical to the arcade version, or other ports, but the task the programmers had was enormous and clearly a lot of time and effort was taken in order to make Mortal Kombat the excellent game that it is. No area of the game seriously lets it down and if it's not in your collection right now it should be the next game you get. 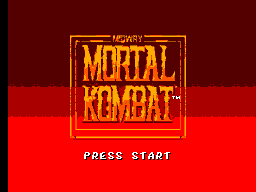 Mortal Kombat stands as an example of what the Master System can do when pushed.